The taxi app may buy the $2 bln European food-delivery group, says Bloomberg. It’s a hefty mouthful for a company that’s steered clear of large dealmaking. As long as Uber Eats and Deliveroo are tearing chunks off each other, though, investors have little chance of a full belly. 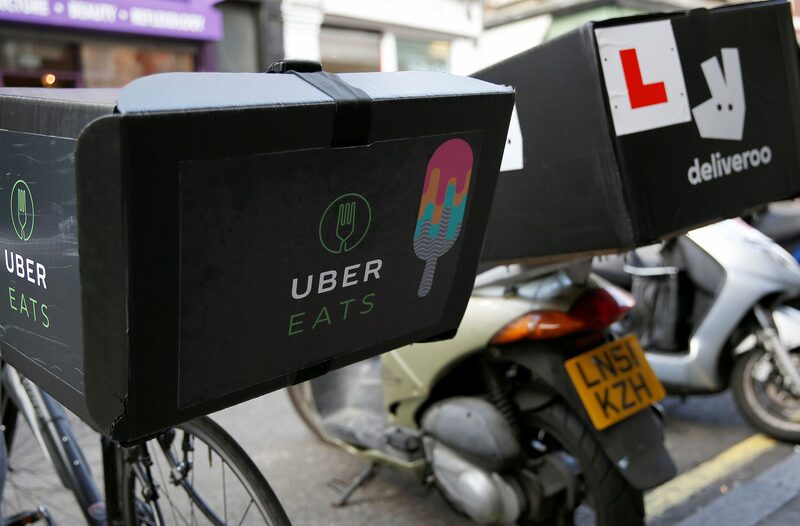 An UberEATS food delivery bike is seen parked next to a Deliveroo scooter in London, Britain September 7, 2016. Picture taken September 7, 2016. Ride-hailing company Uber Technologies is in early talks to buy food delivery company Deliveroo, Bloomberg reported on Sept. 20, citing people familiar with the matter. The value of the deal is not known, Bloomberg reported, adding that the offer would need to be considerably above Deliveroo's latest valuation. London-based Deliveroo was last year valued at more than $2 billion after raising $98 million from private investors. Uber declined to comment. Deliveroo did not respond to a request for comment.